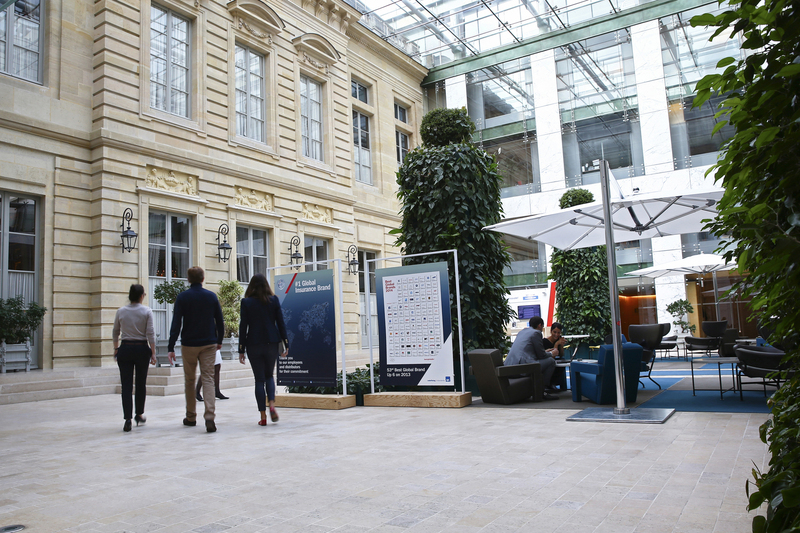 AXA Group announces today it has initiated a simplification of its operating model designed to empower its entities to deliver on the transformation and operate as close as possible to their customers. 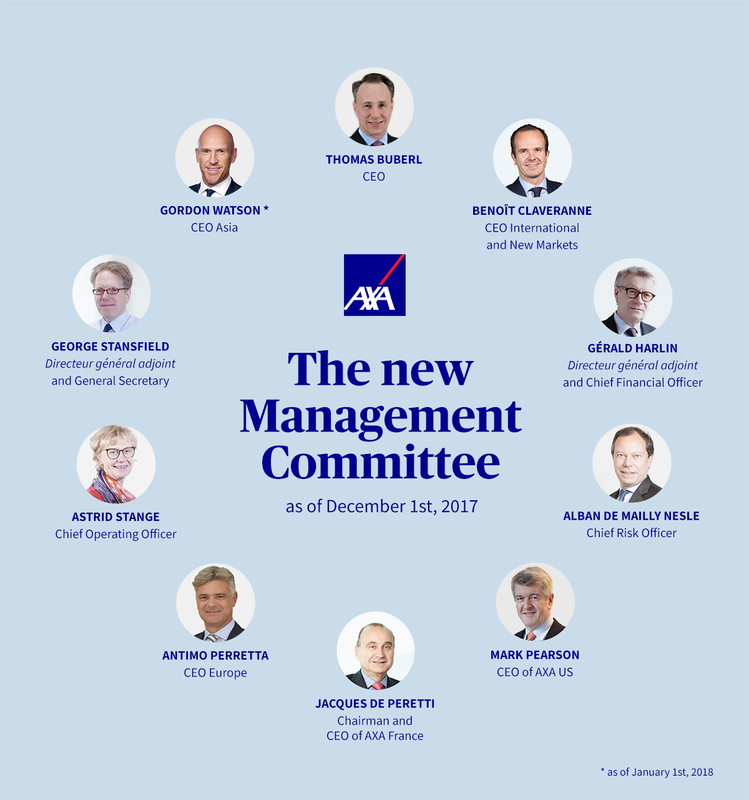 Upon introduction of the new operating model, the AXA Group will be organized based on 5 geographies (France, Europe, the US, Asia, and International), and a single, refocused Corporate Center (reduced from the three layers - head office, global business lines, regions – that exist today). AXA expects the new operating model to be effective in the first quarter of 2018. My objective is to let our teams focus their energy on growing our business and deliver excellent service in their respective markets. I am convinced that local empowerment is instrumental to the long-term success of AXA, by making our transformation tangible on the ground, as close as possible to our clients. In order to achieve this, the simplification we are implementing is an absolute pre-requisite, but also the starting point of a large effort to make AXA simpler for all our stakeholders. “As Deputy CEOs (“Directeurs généraux adjoints”), Gérald and George will support me in steering the strategy of the Group, and I look forward to continuing to benefit from their experience, professionalism and integrity. 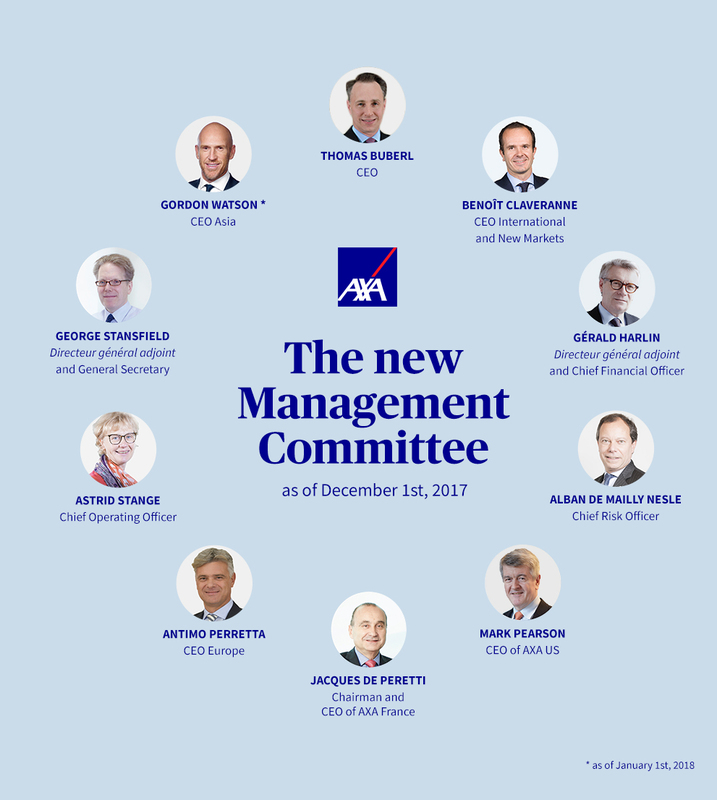 The new Management Committee is an excellent blend of the previous team together with new leaders from across the Group with strong operational experience and excellent knowledge of the insurance industry. It also confirms our ability to attract top talents: Gordon Watson has been instrumental in AIA’s growth trajectory over the recent years and I am convinced that he will lead our Asian businesses to many successes”, said Thomas Buberl. Guillaume Borie, currently Group Corporate Development director, is appointed Chief Innovation Officer.